Club Brugge winger Dennis Bonaventure has blamed the poor surface at the Stade de Ben Guerdane for Nigeria's loss against Libya which has put them in a difficult position of advancing to the AFCON U23 tournament, but is upbeat about their chances of mounting a sensational comeback at the Stephen Keshi stadium in Asaba on Monday. Two goals in either half from Zakaria Alharaish and Osama Albedwi left Imama Amapakabo's wards with a mountain to climb in their bid for qualification but Bonaventure has attributed part of the defeat to the playing surface in Tunisia which disrupted their rhythm of play. Speaking on an Instagram video, Dennis reiterated that the turf was complicated playing on but the team has however, put behind that loss and are focused on getting a favorable result in front of their own fans. "Yes, it was a painful thing we lost. We wanted to win the game and give everything for Nigerians", he said. "The pitch was not all that good, was a bit complicated playing on, but then, that's not an excuse for defeat, and in the next game on Monday, we just to go out and make sure we do everything to win because it is very important. "I hope by the end, we will come out victorious and then everybody is happy." 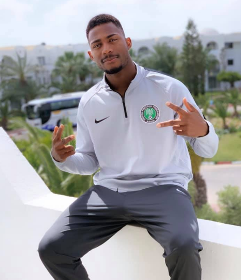 Dennis was sacrificed in a tactical switch after goalkeeper Adamu Abubakar was sent off in Tunisia on Wednesday and it still remains to be seen if he will be handed a starting berth again.